Step inside the new THINC College & Career Academy in LaGrange, Georgia, and you notice right away that everything seems different from a traditional high school—from the design of the learning spaces to the activities that take place there. The school’s furniture also plays an important role in its design. THINC’s planners wanted tables and chairs that could be moved around easily and arranged in flexible groupings to facilitate student collaboration. They approached a local company, Loy’s Office Supplies, which recommended the EDU 2.0 line of furniture from Bretford. THINC is a “bring your own technology” environment, and the school offers laptops and Chromebooks for students to use if they don’t have their own mobile device. Throughout its classrooms and common areas, the school contains community docking stations and tables with video monitors where students can plug in their devices and share their screens as they collaborate on projects. There are also many soft, comfortable chairs with built-in power outlets where students can work independently or in small groups. 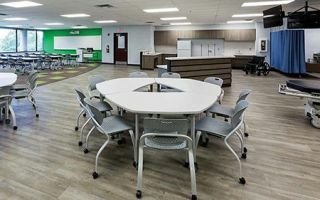 The school’s innovative design and technology-enabled furniture will facilitate a new kind of learning experience, in which students will be rolling up their sleeves and diving into hands-on, career-based projects. Dennis Pierce (denniswpierce@gmail.com) has been writing about education and technology for nearly 20 years.